Why do you think that Osama bin Laden had a role in the operation, other than that of a patsy? I do believe Osama bin Laden was a patsy first and foremost. The role I mention is peripheral to the operation (moral support, incitement, foreknowledge). It comes down to what bin Laden said in the 2001 videotape and interviews prior to that, plus that at least three of the hijackers had backgrounds congruent with genuine Jihadists. It is not a secret that bin Laden did not like American policies in the Middle East and Africa and would support actions against them. You only need listen to the mentioned interviews or read the 1998 fatwa he put his name to. I really cannot imagine he would discourage anyone from a 9/11 style attack, in fact his motive was the opposite. That is, unless bin Laden was just an unbelievably accomplished actor and kept the show up for over a decade. Then there is the 2001 videotape - this makes no sense as a fake mainly because, 1) the format is so irregular and 2) there is no confession contained within. If a fake were to be made wouldn’t you expect ‘bin Laden’ reading a scripted speech containing an actual confession, then released through al Jazeera? If you accept authenticity of the 2001 videotape, it appears clear that bin Laden both personally knew the hijackers and that an attack was to occur. The three hijackers I mentioned are al Mihdhar and the two al Hazmi brothers. The information even before 9/11 is that they were tied to previous attacks (on the U.S. embassies and USS Cole) and had longterm connection with ‘Al Qaeda’ operations. They were not Westernised and well educated like the other hijackers. These were the hijackers who were under heavy surveillance, received assistance from a Saudi government agent and protection from the CIA after the FBI were rightly throwing a fit about their being in the United States prior 9/11. It is apparent these guys in particular would have struggled to get through the security net and bed into the country without that assistance. This all leads me to believe these guys were genuinely bin Laden’s men. In all, what I speculate happened, is that 9/11 was inspired by the Bojinka plot (oh but not by who some might think). Apparently at that time only one suicidal pilot from all of Al Qaeda could be found (unsurprisingly the terrorists wanted to plant bombs on planes and escape with their lives) so the hijacking and crashing into landmarks element got knocked on the head. The plan was uncovered and thwarted anyhow. The two most important points: lack of volunteers for the operation and U.S. sources now knew the type of plans in ‘Al Qaeda’ circles. Western agents led by the Hamburg cell of Mohammed Atta, Marwan al Shehi and Ziad Jarrah (otherwise known as lead pilots of three of the 9/11 aircraft) were sent to infiltrate bin Laden’s network (not difficult to do) and drop the 9/11 operation at his feet. To which bin Laden, being bin Laden, said, “Allah is great, go for it… anyone else want to participate?” at which point the rest of the hijackers stepped forward (agents and the three genuine Jihadists alike). And that was it - he knows the hijackers, he knows the attacks are going to happen, he morally supports it - no it wasn’t his operation but bin Laden was screwed. It was a brilliant plan because it gave a real element of truth to the official narrative. Why do I get to a natural end point of a post and still feel I have a million things to add? Ah ok. For a moment I thought you were saying that he was a major player in all this, heh :-p.
The role I mention is peripheral to the operation (moral support, incitement, foreknowledge). You really think he knew it was going to happen? If so, based on what do you form this view? I've seen various videos that allege to have him speaking in them. Could you link to the one you're referring to here? and interviews prior to that, plus that at least three of the hijackers had backgrounds congruent with genuine Jihadists. I believe I heard him state at one point in time that he didn't have anything to do with 9/11 and that he wouldn't kill people so indiscriminately.. but I can't source where I got these notions, so let's just say it's my current impression. Then there is the 2001 videotape - this makes no sense as a fake mainly because, 1) the format is so irregular and 2) there is no confession contained within. If a fake were to be made wouldn't you expect 'bin Laden' reading a scripted speech containing an actual confession, then released through al Jazeera? What if those behind 9/11 just grabbed a video of some sheikh talking about 9/11? Is this not possible? If it's the tape I'm thinking of, many have stated that the guy really didn't look like Osama. If you accept authenticity of the 2001 videotape, it appears clear that bin Laden both personally knew the hijackers and that an attack was to occur. Actually, from what I heard, the official translation was done badly, perhaps even intentionally misleading, and if you were able to understand the untranslated speach, you'd find that he never claims to have known the hijackers. The three hijackers I mentioned are al Mihdhar and the two al Hazmi brothers. The information even before 9/11 is that they were tied to previous attacks (on the U.S. embassies and USS Cole) and had longterm connection with 'Al Qaeda' operations. I've heard that one (or both) of those attacks were also inside jobs. But again, I can't source where I believe I heard this. So much information, and just not that much time to sort it all. They were not Westernised and well educated like the other hijackers. These were the hijackers who were under heavy surveillance, received assistance from a Saudi government agent and protection from the CIA after the FBI were rightly throwing a fit about their being in the United States prior 9/11. It is apparent these guys in particular would have struggled to get through the security net and bed into the country without that assistance. This all leads me to believe these guys were genuinely bin Laden's men. You really think Bin Laden had the power to let these people through? I think the true orchestrators here are the people who have the power to tell the CIA and the FBI to let these guys through. I imagine you've heard of Able Danger? That actually made the news for a time. I’ve not seen confirmation bin Laden was the mastermind or director. I’ve seen bin Laden accept before where he gave direct order leading to the death of Americans, but not for 9/11. The evidence the 9/11 Commission relied on to show bin Laden was responsible is the interrogation of Khalid Sheikh Mohammed, obtained under torture at Guantanamo. I remember he suddenly admitted to every terrorist attack under the sun one day. A number of experts from the CIA and legal professions have expressed concern about validity of this evidence obtained under torture. I’m not surprised… I’d tell them what they wanted to hear after six months of waterboarding and abuse of my family too. In addition, the 2004 videotape held up by the media as a total ‘confession’ is nothing of the sort. It’s kind of amusing that whenever you ask anyone the specific details that bin Laden was responsible for, they can never tell you. I’m referring to the 2001 videotape (you would call it the ‘fat bin Laden’ videotape). We have to be careful of the U.S. transcript here because a number of independent translators have said sources wrote in a lot that they wanted to hear and, “where it is held to prove the guilt of Bin Laden, it is not identical with the Arabic”. The differences noted are subtle but change the meaning of statements. For instance the U.S. translation has bin Laden saying, “we asked each of them to go to America”, whereas independent translators have bin Laden saying “they were required to go”, which is not the same - the first is more toward giving an instruction and the second is more passive. Then again, I’m not sure it really matters. This is another point I believe supports the video is genuine - why fake a video that still needs to be mistranslated? Anyhow, even accounting for the above mistranslations, it appears bin Laden had detailed knowledge of the hijackers and coming attack. How does bin Laden know who was trained to fly and which hijackers knew each other or not? What’s he on about he was, “worried that maybe the secret would be revealed”? And, “be patient”? Methinks bin Laden knew something. There are different translations and ways of reading into them, definitely. But the point I cannot get past is that bin Laden apparently knew the hijackers and that the attack was coming. That is nailed on if the videotape is genuine. It still doesn’t mean it was bin Laden’s operation. 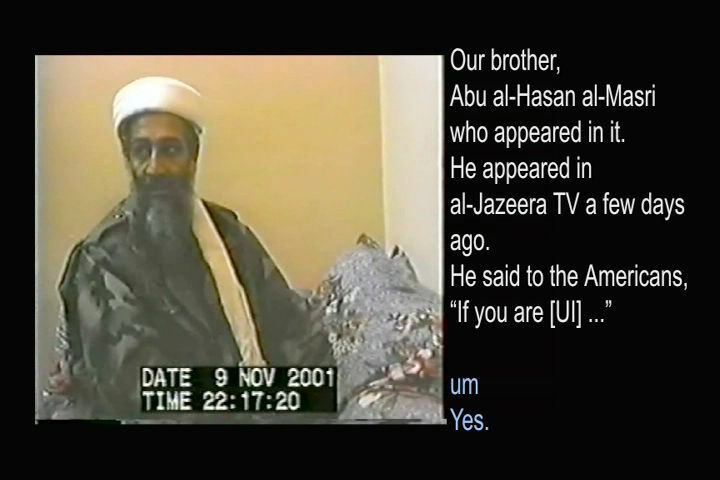 There are other quotes from the videotape that lean toward it being Atta’s operation and even indicating that bin Laden perhaps did not know all of the specifics. An excerpt from the videotape is in post #370 if you want to look out for the sections I quoted. You might need to hunt down that post because the links are bodged on this thread. If past precedent is anything to go by, then bin Laden saying he was not responsible for an attack does not necessarily mean he did not know of the coming attack. It seems that when he had only a peripheral role he would deny responsibility. Also watch out when people show that bin Laden had previously endorsed attacks on civilians (yes, he really did in other statements including the 1998 fatwa). The point to remember is that bin Laden never specifically targetted civilians, he really did not see it as an appreciable act, just an acceptable consequence of war; reciprocation to the United States’ own stategy. Does it look like bin Laden to you? I think it could well be. At least, I wouldn’t like to say it’s not. Nooo, not at all, I didn’t mean bin Laden let them through. The CIA bin Laden unit let al Mihdhar and al Hazmi through, basically fought off the FBI they did. FBI agents complained like hell both before and after 9/11 about this CIA unit and the Bush administration tying their hands. The excuse given is “the wall” that existed between agencies, though FBI agents would say different and even the 9/11 Commission stated there is no reason “the wall” should have resulted in what occurred. There was further collaboration with a Saudi government agent inside the United States who assisted those two hijackers in opening bank accounts, arranging flying lessons and renting accommodation, which just happened to be with a U.S. intelligence informant. Regarding Able Danger, this was a military intelligence operation which had picked up on Atta’s group inside the United States and was also shutdown by the CIA. There is also the case of FBI investigation into Zacarias Moussaoiu being blocked. Of course it was intelligence agency driven, they paved the way. 9/11 wouldn’t have happened without such intervention, genuine law enforcement would have torn the operation down if allowed to do their job. Heck, al Mihdhar and al Hazmi would never have got into the country if procedure had been adhered… but there just happened to be a snafu with the CIA paperwork and they weren’t put on the block list. And then afterwards… what was all that about letting the implicated Saudi agent and a large number of detained Israeli agents off the hook scot-free? There was barely a whimper. This Saudi guy has aided the hijackers and the 9/11 Commission basically say, well… he’s an alright guy… it was probably just coincidence. Really?? Then Israeli intelligence are caught celebrating the tower collapses, sniffer dogs react as though detecting explosives in their van, they fail numerous lie detector tests, amongst much more and they get deported on… a VISA violation. You’re joking?? Oh it really is ridiculous. Thanks Q. You've given me a lot to think about. As to the tape; I'm still not persuaded that that's him. In other videos, he just doesn't look that.. seriously, he looks a bit like a mouse in that one. It reminds me of the "Osama" that they allegedly killed in Pakistan. Also, I believe his skin tone is much darker in this one then in other videos of him. Considering the importance that the world was beginning to give bin Laden even before 9/11 and certainly afterwards, I don't think it's unreasonable to ponder the possibility that they would have someone impersonate bin Laden. But regardless of whether or not it was him, I think that the official translations that tended to exagerate the speaker's role in the attacks is indicative of those behind the official narrative trying to get this man's words to fit the official story. Regarding the CIA's essentially aiding the hijackers through blocking investigations and 'messing up' paperwork, great info. I may well have seen it in the various pieces of information I've read and seen, but it's good to be reminded of it all.. hard to remember it all, laugh :-). It reminds me of the "Osama" that they allegedly killed in Pakistan. I'm sorry, but have they released photos of the raid that I'm not aware of? I don't always follow the news so it isn't implausible that there may have been photos released for confirmation of bin Laden in that raid and I missed it. Did they do that? Not that I'm aware of; in fact, I believe the administration resolved not to release any pictures of the raid; honestly, I would actually be quite surprised if any pictures of the raid were even taken. No, I was referring to the videos that were allegedly recovered in the compound that show a man alleged to be Bin Laden making speeches. Thanks Q. You've given me a lot to think about. As to the tape; I'm still not persuaded that that's him. In other videos, he just doesn't look that.. seriously, he looks a bit like a mouse in that one. It reminds me of the "Osama" that they allegedly killed in Pakistan. Also, I believe his skin tone is much darker in this one then in other videos of him. If you check here you can see there are more known ‘Al Qaeda’ figures present in the video - they look darker than in other images too. For bin Laden himself, the features really depend which angle he’s at. Have you ever noticed how some ladies online (the ones obsessed with posting pictures of themselves on facebook or whatever) will take photographs at certain angles and in certain light to present their better side? The effects are great, it makes a huge difference… but you know in person that is really not what they look like. I’m just trying to apply how images can differ to a more real life situation people might have come across. I’ve only seriously discussed the intelligence agency issue once here (only one official theorist crazy enough to really try disputing it) - their conclusion, that the CIA bin Laden unit was filled with vastly incompetent agents and that it warranted an investigation. Or regarding the Saudi agent detained by British police then released by U.S. authorities, it was claimed that whilst involved it was more important that the U.S. protect their relations with that country than solve the 9/11 crime (oh yeah, I agreed with that). Of the Israeli agents who were detained in relation to 9/11 and then deported with little fanfair and no charge, the counter-claim has been… ok, they were doing ‘something’ but I don’t know what, and I think it couldn’t possibly have been to do with the attack, oh no. Basically this whole area suggesting a story behind the story has received no explanation and has the official theory stumped. I was referring to all of the above actually, and I appreciate your taking the time to clarify in detail. I think I do as well, but I'm just as prone as anyone else to making assumptions from time to time. This was the core reason for my question and I have come to realize that you strive to achieve an unbiased conclusion based on the available evidence. I didn't always believe this to be the case so I am very pleased to see that some of my earlier assumptions about your motives in these debates were incorrect. The more discussions I've had with you the more I've come to respect your reasoning and I really admire your ability to effectively illustrate your point. I've been called an "official story believer" and a "supporter of the government version" on numerous occasions, which I find somewhat strange considering that I don't recall ever saying that every piece of the investigation is completely accurate and without error. Like you I've reviewed a lot of information, but based on the information I've reviewed the most likely conclusion in my mind is that the general sequence of events as conveyed by the "official story" is the most plausible; that being that terrorists hijacked airplanes and flew them into buildings as an attack against America which resulted in many deaths and the collapse of WTC 1, 2, and 7. That isn't to say that I put myself fully behind every finding of NIST or the 911 Commission, just that the general gist of this seems the most plausible scenario and I haven't seen anything that conclusively suggests that 911 was a false flag operation perpetrated by any portion of the US government; be it a small committee comprised of key intelligence people and officials or something of a larger and broader scope. If there was some kind of documentation that backed this up like memos detailing a plan for 911 specifically, recordings of the people behind it, directives passed down to the operatives, etc... then I'd not ignore said evidence; just as I haven't ignored it regarding Osama bin Laden's various statements. If the speculations you are referring to here are regarding the interpretation of bin Laden's statements I'd like to clarify that my impression of those statements is that they support the conclusion that he played a major role in the planning and execution of the 911 attacks; if not the mastermind, then one of several collaborating masterminds at the very least. I understand and acknowledge that other interpretations are possible from those statements and I respect that you may find those other interpretations more plausible. I'm not saying that I'm absolutely right and you're absolutely wrong, just that from my perspective the interpretation I've shown is a supported and valid possible interpretation. Furthermore, I am of the opinion that the interpretation I've shown is more plausible than any other interpretation I've seen. To be completely clear, this is merely my opinion and from my perspective. I like the way you've worded this and I don't think the point is without merit. I'm still amazed at how effectively the 911 plan circumvented our national defenses and I agree that on the surface it can appear to be the result of many coincidences; but for all intents and purposes it was a sneak attack, a sucker punch if you will. And even though we may have been able to anticipate the possibility of such an attack before hand, preparing for it with possible responses on an international level would have been an extreme undertaking; as we've found to be the case after the fact. Our defenses and readiness are much better today for such a thing than they were then, but it still isn't air tight. Also, if the coincidence you speak of here includes the collapse of the WTC buildings, in my opinion that isn't a coincidence at all. I think the collapse of those buildings was inevitable as soon as the planes impacted; there was no stopping it without immediately dousing the fires. I know that you question the collapse model by NIST, and I'm sure that there are incorrect points within the NIST reports, but the overall collapse model is based on sound principles of physics. There was no stopping those buildings coming down without immediately dousing the fires and it wouldn't require planted demolitions to initiate those collapses. Again, these are just my opinions from my perspective based on my understanding of the information that I have reviewed. It did indeed answer my questions and I again thank you for taking the time to clarify the points. That isn't to say that I put myself fully behind every finding of NIST or the 911 Commission, just that the general gist of this seems the most plausible scenario and I haven't seen anything that conclusively suggests that 911 was a false flag operation perpetrated by any portion of the US government; be it a small committee comprised of key intelligence people and officials or something of a larger and broader scope. If there was some kind of documentation that backed this up like memos detailing a plan for 911 specifically, recordings of the people behind it, directives passed down to the operatives, etc... then I'd not ignore said evidence; just as I haven't ignored it regarding Osama bin Laden's various statements. The agents of CIA Alec Station deliberately blocking the FBI from investigating two terrorists known to be inside the United States and who would become the hijackers doesn’t suggest assistance? After head of the aforementioned CIA section held regular meetings with Bush and co. under whose short administration the FBI stated their bin Laden related investigations had become restricted. 9/11 would not have happened without that. How much more suggestive could it be? This is a real organisation and chain of command with infiltration, deception and war on record. Not the wishy-washy ‘Al Qaeda’ and bin Laden who we can’t pin a single specific order on. There are more documents, reports and witness testimony showing that the U.S. system facilitated these two hijackers than you will ever find of bin Laden giving an order. The Northwoods document took 35 years to come out… in all that time you would have believed only the Cubans were capable of presenting attacks on the United States. And what of the Israeli and Saudi agents, utmost allies of the United States in the Middle East, also implicated in the 9/11 attack? Their connection and in one instant direct aid to the two hijackers doesn’t suggest assistance? But present the mere fact bin Laden knew of the attacks and hijackers and apparently none of the above matters… bin Laden was the main man. I think it is a very selective conclusion that fails to account for the complete set of circumstances. If the speculations you are referring to here are regarding the interpretation of bin Laden's statements I'd like to clarify that my impression of those statements is that they support the conclusion that he played a major role in the planning and execution of the 911 attacks; if not the mastermind, then one of several collaborating masterminds at the very least. Who might the other collaborating minds be? I'm still amazed at how effectively the 911 plan circumvented our national defenses and I agree that on the surface it can appear to be the result of many coincidences; but for all intents and purposes it was a sneak attack, a sucker punch if you will. And even though we may have been able to anticipate the possibility of such an attack before hand, preparing for it with possible responses on an international level would have been an extreme undertaking; as we've found to be the case after the fact. Our defenses and readiness are much better today for such a thing than they were then, but it still isn't air tight. The FAA, NORAD, Pentagon, FBI, CIA and Secret Service were all aware this type of attack was possible - numerous exercises with similarities to 9/11 had taken place. At the exact time of the hijackings, airliner hijacking exercises were taking place. As the planes hit the WTC, an exercise for an attack at the WTC was set to take place. As the Pentagon was hit, an exercise for a plane crash into a government building just 30 miles West was taking place, the simulated plane departing from the same airport as Flight 77. That’s real intelligence they had based on evidence, not just supposition. Further intelligence warnings were coming thick and fast. It will have come as no surprise to many in these agencies when the 9/11 attack occurred. It was certainly no surprise to FBI agent Steve Bongardt who had warned that if the CIA continued to protect al Mihdhar and al Hazmi then people were going to die… others in the FBI were also fully aware of the threat. This idea it was a “sneak attack” is for public consumption, only to excuse those who failed in their duty and present the impression the attack was unavoidable. Then instead of us looking where the attacks were allowed to occur and pinpointing who facilitated that, we all shrug our shoulders and say, “well… sneak attack”. After saying all that, I don’t believe the air defense reaction (which I think you are referring to) were all bad. The first two hijackings and impacts just happened too fast, though fighters weren’t far off. The response to Flight 77 was quite appalling - fighters were further away at the time of impact than when they had taken off, despite NORAD pleading for coverage over Washington. Either 1) there was a terrible breakdown in communication or 2) there was a deliberate interruption in communication. And Flight 93... It looks like they got him. Anyhow, the hijackers should never have been able to set foot on those planes in the first place. The coincidences include every aspect of 9/11 before, during and after. You still don’t get my position on NIST - I don’t doubt the physics of their models. Who am I to question scientists on physics? It is just necessary to understand exactly what those models show by NIST’s own admittance. The very fact you believe the collapses were “inevitable” due to the impacts is in violation of NIST’s best estimated model. You disagree with NIST’s best estimate… not me. Apologies for my delay in responding but I have been preoccupied with other matters. I am trying to think of ways to respond so we are not going around in circles, or so that we can just understand each others position and agree we have come to different conclusions. Firstly, my issue with the Saudis being used is a more minor concern than a major concern (with respect to the war in Afghanistan) in that the plan as conceived allowed a possible risk that in the aftermath and trauma of 911 the public mood would be directed not only at the Afghans, Taliban and Al Qaeda but also possibly at one of the allies in the region. Given the almost unprecedented shock and trauma in the public it would be hard to be certain where exactly the desire for revenge from the public would lead. It may be that the risk was considered, evaluated and believed to be easily managable as you assert. To be honest if the only flaw I saw in the plan was possible unintended ramifications for Saudi Arabia I wouldn't have such a problem getting on board. I don't know why you are asking me if I seriously think the public were going to rail against this, march in the streets No war against Afghanistan! Save bin Laden. I have never said Al Qaeda wouldn't be also right in the firing line, by design of the conspirators (accepting for the argument there was an inside conspiracy). Firstly, no I don't give the public a lot of credit. This is why I continue to maintain that a plan this elaborate was unnecessary, if the desired outcome was to increase war spending in general and war in the middle east in specifics. If this was the actual objective then there are much easier ways to do this. Sustained propaganda against Hussein and Bin Laden and Al Qaeda would have reached the same outcome with zero risk. In fact given the individuals and organisations we are talking about the propoganda wouldn't be a particularly hard sell. Your argument against this is that yes but that wouldn't have created the definitive transformative event as required by the document. I say the mere fact that someone floated the idea of needing a pearl harbour or transforming event is not evidence it was ever acted upon, or is related to this event. Note, I don't say its completely irrelevant, I understand how it opens up speculation that it may have been considered, thats fine. As to the inevitability the public majority would believe a 9/11 connection with Iraq. Let me ask you this question, do you think the case made for war on Iraq was a compelling one? Do you think it had the hallmarks of a well thought out plan with all the pieces already in place, or a case which was being made effectively on the run? For example do you believe that when the plan was being formulated to engage the terrorists, hijack the planes, plant bombs in the buildings, cover the tracks etc that they also came up at that stage with the hidden weapons of mass destruction angle? Maybe they did, maybe they believed that it wouldn't matter, to me though the planning and precision which would have been necessary to pull off the 911 conspiracy was not evident in the case for war on Iraq. I believed that I had but I will try and answer this in another way because I am obviously not communicating this properly. When you say I have not identified what the risks are I presume you mean the risks in the plan not the risk to the perpetrators if discovered. Just out of interest if there was an inside conspiracy and it is proved what do you believe would happen to those involved? I ask to see if we agree at least on the quantum of what was at stake. By any measure what you are asking people to be involved in is an abhorrent act. It is an act which any reasonable person would be appalled at. Sure there will be some indiviuals who will be ok with it because they will see the end as justifying the means. The more people involved though the greater the risk someone will blow the lid on the whole thing. On the theory as you see it how many people do you see as being involved (obviously I'm just asking for an estimate), and how many organisations? Lets say we are part of this inside conspiracy. We are in at the planning stage. We all agree that American military spending is flagging to dangerously low levels. We need to act. We agree that we need a military threat to rally against and an actual war to increase spending. The following motions are tabled. Sustained propoganda against individuals already hated by the Americn public, to manufacture a threat to American security and plant ubiquitous terorists in to the mind of the public as the new communists. Pros: Public, we all agree, are mostly easily led, and will not be hard to manipulte to this end, given the targetted individuals involved. 5. Blow up those buildings. Explosive traces will not be discovered as people will believe all damage is from planes. 8. In aftermath tie in Iraq as rogue state. Rely on Iraq harbouring weapons of mass destruction. Compile evidence for this later. Pros: Will be cataclysmic event which will increase domestic appetite for war. Isn’t speculation about having an open mind and considering possibilities? Yet for some it appears the opposite; speculation is deliberately used to close doors and draw absolutes. .. when did I say a conclusion could be ruled out by speculation. I was responding to you saying that my speculation should be ruled out and closing the door on my speculation as I was relying on what I thought was necessary and required, not what the conspirators actually thought. My point was that neither of us knew and we were both speculating.I am not sure then why you are trying to turn this back on me. We are both looking at a set of facts and making assumptions we think are warranted. I have considered your points. That they do not personally convince me is not the same as me closing my mind. I agree with all this. I say it is not confirmed either way that bin Laden or those in Washington were responsible.I think it is highly unlikely to be those in Washington for the reasons above but I have stated I am not convinced, not that it is impossible. I have no idea if bin laden was involved or not. This latter part really annoys me. It doesn't unnerve me at all. It is not my government. It is not my country. I have no love for the neo cons. My whole argument has been predicated on the assumption that if a false flag operation would be contemplated, it would not have been done in this way, given the risks. Basically there are three general approaches to issues of conspiracy. b. I belive in everything the government tells me and they would never do this. That you disagree with why I would doubt the insider conspiracy I have no problem with. But trying to simply dismiss by doubts by lumping me in approach b. is lazy. I haven't addressed your posts as if you were in approach a. So you think an attack planned by a rogue/exiled group of Saudis granted sanctuary and operational base by the Taliban in Afghanistan, could have led to the public ignoring the official line that Afghanistan not Saudi Arabia were the threat and demanding a war on latter country. And also that the Bush administration would have been forced to bow to this public pressure. Ok, I’ll leave it there. As to the inevitability the public majority would believe a 9/11 connection with Iraq. Let me ask you this question, do you think the case made for war on Iraq was a compelling one? Do you think it had the hallmarks of a well thought out plan with all the pieces already in place, or a case which was being made effectively on the run? For example do you believe that when the plan was being formulated to engage the terrorists, hijack the planes, plant bombs in the buildings, cover the tracks etc that they also came up at that stage with the hidden weapons of mass destruction angle? Do I believe the case for the Iraq war was compelling? No I don’t. It was however compelling enough for the large majority of American citizens, including a large proportion who believed Iraq was connected to 9/11. Don’t be fooled into thinking there had to be a direct connection between the 9/11 attack and Iraq. That the public deemed this based on propaganda of the Bush administration merely further demonstrates how easily they were led. The only equivalent actually necessary to draw was that of 9/11 to the WMD threat - lumping Iraq in as part of the ‘War on Terror’. I believe that when the 9/11 plan was formulated, it was entirely obvious the attack would lend huge support to a war on Iraq… and so it proved. Yes I am referring to risks in the plan. Even if there is risk in the plan, there was still reduced risk to the Neocon masterminds, seeing that the majority of field agents appear to have been foreign. If the operation were exposed and fully unravelled (which was never in a month of Sundays going to happen so is utterly pointless speculation), then we’d be looking at lethal injection for the masterminds. The more people involved though the greater the risk someone will blow the lid on the whole thing. On the theory as you see it how many people do you see as being involved (obviously I'm just asking for an estimate), and how many organisations? Less than twenty individuals of U.S nationality. Any number of foreign agents. Organisations?? Not one. None of it was done in the name of an organisation. When I mention any organisation, it is in reference to particular embedded units/individuals. In my recent posts on the thread I’ve been talking about the CIA blocking the FBI from going after two of the hijackers pre-9/11. I believe that was down to an order from one individual in the CIA aware of the false flag operation. This is an ineffective and drawn-out operation in comparison to the stated requirement and what they got. I’m thinking we only have four years guaranteed in power to get the wars underway with strong public support and enact regime change to the stage we want. I don’t think an empty propaganda campaign provides the urgency to ensure objectives are met in that time. This may have been their one opportunity… ‘motion 1’ risks letting it slip away. 1. It appears the hijackers were both terrorists and agents. 2. I believe a plane switch was possible though not necessary. 6. I wouldn’t say the later demolition of WTC7 was planned that way. 7. I repeat, the link was already made prior 9/11. 8. There was no reliance on Iraq actually having WMDs. Anyhow, I’m backing ‘motion 2’ as a guarantee that all objectives are met. Aha these would be the supposed risks I asked for. Please could you pick just one otherwise my post is going to grow out of control. the quest for truth will NOT, and NOR SHOULD IT, end !! Just tell THE TRUTH, I'm sure we can cope!! -All those dead soldiers ided for WHAT REASON? And please - no dumbass yanks replying with what you saw is the truth - I will remind you all that UNLESS you produce GENUINE EVIDENCE of the White House attack AND the Shanksville "story" 0- then I remain unable to believe anything about this supposed attack on your democracy! In war, the truth is the biggest casualty.